Local law enforcement agencies are looking for a man they say attacked two people with a baseball bat on the shoulder of Interstate 15 in Wildomar Monday night, March 2. 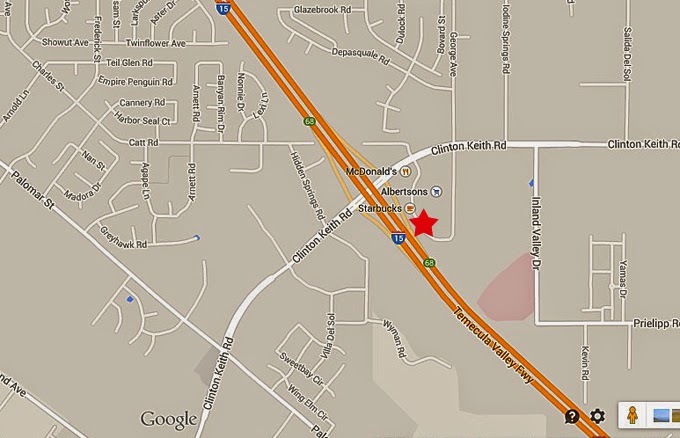 According to a news release from the California Highway Patrol, officers responded at 6:40 p.m. to the report of a physical altercation on the shoulder of northbound I-15 just south of Clinton Keith Road. Officers located two victims of major blunt force head injuries -- one male and one female. The victims and a witness told officers that during a confrontation outside their two vehicles parked on the shoulder of the freeway, a male suspect struck both victims with a baseball bat. The victims and a witness said the suspect and a female passenger fled the scene in a white Honda Civic prior to the officers' arrival. The victims were transported to Inland Valley Medical Center for treatment. The suspect and his accessory in the crime are still at large. According to the CHP report, the suspect is a Hispanic male, about 20 years old, standing about 5 feet 11 inches and 160 pounds. The other occupant of the vehicle that fled the scene is listed as a Hispanic female, about 30, standing about 5 feet 3 inches and 125 pounds. Anyone with information regarding this case is urged to call Temecula CHP at 951-506-2000.